As the concerns over the nuclear plants become even more grave, we have decided to take little Woody to Oregon to breathe some fresh air. The levels of radiation in Tokyo are by no means high enough to cause harm to humans--they are in fact way lower than the amount transferred on a long haul flight--but, the situation is worsening and nothing seems to be secure. We've been keeping him safe in the house for the last few days to prevent his little developing lungs from being exposed. I'm going stir crazy. The US government finally came through with an emergency passport for Woody. Our sister-in-law, Claudia, was able to make some connections from her work at government offices in D.C. to get us bumped up on the list. We'll be leaving for Oregon on Saturday. James is coming until his spring break is over and I'll be there with the little babe through April 22nd, or until things settle down. 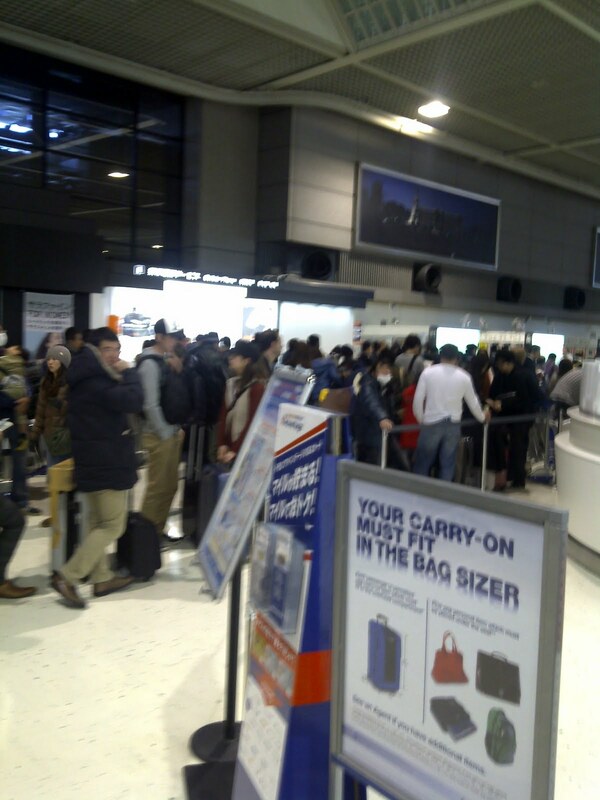 James's brother, Gary, sent this photo to us from Narita airport this morning. They visited for 3 days--shortest trip ever!--before deciding to return home because it was a difficult time to be a tourist in Tokyo. Looks like long lines will be greeting us on Saturday. In 5 years of living overseas, we've never had to depend on the US embassy for any kind of support. Through this entire situation what has become transparent is how politics and diplomacy plays a role in a crisis like this. Many Americans live in Japan and rely on the embassy for information in English when a situation like this occurs. We'd like to believe that our safety is their number one concern, as the ambassador has stated in numerous press releases, but the truth is, we know that politics is more important. Japan and America have a strong relationship and the US government can't afford to put it in jeopardy. To recommend the evacuation of US citizens living in Tokyo, like many European embassies have done, would undermine the Japanese authority. All week, statements from the embassy only say that we should heed the advisories of the Japanese government, giving little more advice or information about what to do. However, it became clear that the situation was more dangerous than we have been hearing when we learned that the US has recommended the evacuation zone be moved to 50-75 km radius around the nuclear plants and that the navy will begin testing radiation levels across Japan. It's a sign that they are carefully stepping around the Japanese government and taking matters into their own hands. We feel a sense of sadness and disloyalty by leaving Japan. All the Japanese office and support staff at our school are still there. In a way, they have also become like family to us. They aren't leaving, but they have watched the entire international community flee. That spreads fear among them where maybe there doesn't need to be fear. We pray that they will be safe in the coming weeks. I could post a picture of the apocalypse, based on the tone of this blog post, but I think we can all use some baby-bath-time-love instead. I hate that James won't be able to see this awesome little guy for a few weeks. 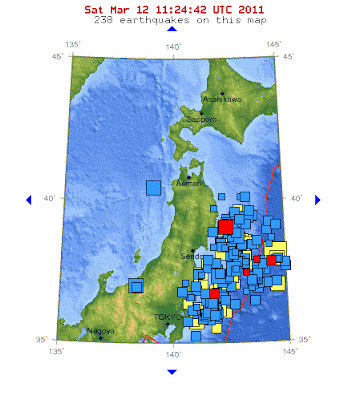 This updated map shows 452 earthquakes in the last week. Aftershocks continue all up and down the seaboard. The earth is truly readjusting itself. This morning at 4:45 we first heard a deep grumbling that sounded like a freight train. It was almost as if we heard the plates themselves moving as the vibrations worked their way up our building and jolted us. Friends in other parts of Tokyo heard the same noise. When there is a lack of clear information, fear and misinformation spread rampant. For the international group of Tokyoites, it's the fear of the unknown: more aftershocks? the REALLY big one still to come? nuclear radiation spreading to Tokyo? food shortages? trains to the airport cut? rolling blackouts until the end of April? The Japanese seem to be the picture of calm and stoicism. At least that is what is shown in their poised demeanor. News reports show those Japanese most affected by the tsunami calmly waiting in straight lines for necessary supplies and walking instead of taking overcrowded transportation. They wait patiently for news from the government and help each other as needed. It's just what they have to do at this point in time. Japan is a country that is supremely organized and prepared. But I believe it is also a culture of sacrifice. Self-indulgent panic does nothing for the greater good of their country or humanity. When it was announced that blackouts would ensue in order to conserve energy, citizens voluntarily cut enough energy usage that there was no need for mandatory electricity outages. Not many societies would be so quick to react. But the international community? Everyone wants to get the hell out of dodge. Starting on the Saturday post-quake, teachers, families and other expats started heading for the airport and shinkansen to take them away from Tokyo. For those of us who do not speak Japanese, there is always a fear that we don't know the whole truth, that we might miss something in translation. There is also a lack of trust in government. People want to be rational, but the initial response is to flee. Because we can. The international community is not rooted in Japan like the Japanese are. At the slightest disconcerting soundbite, people are ready to jump into the comforting arms of a home-country, or any country with a nice beach, that is not facing nuclear fallout. Seisen closed for the entire week because all the other Tokyo international schools did. 1/4 of James's class left the country over the weekend. Fathers are sending their wives and children to stay with family in the south. Out of a group of friends 15 or so deep, only 4 people still remain in Tokyo with us. And they aren't sure they are going to stay, either. We no doubt feel our mortality this weekend. The map above shows 238 earthquakes in the last week in our area. Not to mention the massive 8.9 that hit 230km away on Friday afternoon at 2:46 p.m.
Woody and I were home together and James was at work. I had just walked downstairs to check on our sleeping babe. He was in his bouncy chair in the bathroom (I shower anyway I can these days) and I was confused as to how it was bouncing freely while he was sleeping. I quickly realized that the earth below me was moving and I grabbed him out and braced us against the wall. The shaking wasn't violent, but rather was a strong sensation of swaying, like being on a boat. It almost made me seasick to watch the walls as they moved. Woody slept through the whole thing. I, however, was yelling expletives (sorry, son). We shook for 2 minutes before I felt safe to move from the wall. After something like that, its tough to tell if the earth is still moving of if it's just your nerves. Amazingly, nothing fell around our house except for an already precariously placed horn on the wall. The Seisen buildings, however, are over 60 years old. The earthquake struck about 35 minutes before the end of the school day. James had the girls get under their desks like they have practiced many times. Once the shaking stopped, the girls grabbed their zukins (the head covering pictured above) and emergency food bags and evacuated to the tennis courts. They waited it out until the building was cleared. Everyone was fine and was able to go home, but due to the halting of the trains and the gridlocked traffic, many students were stuck at school until 8:00. All the cell phone servers went down and it was nearly impossible to get in touch with families. James finally left school at 8:30 p.m., still waiting to hear from one family. I was meant to have a "meet the baby" shower at 4:00 at a friend's house, but since everyone was stuck at school, no one was able to make it. My friend, Allison, and I sat around with our baby boys watching the coverage of the aftermath on BBC. James, Woody and I walked home at 9:00 after realizing that there was no chance of catching a cab. The streets were lined with people walking home from work. Imagine very crowded train cars, that leave a station every 3 minutes, dumped on the sidewalk. Usually quiet streets were packed with men in black suits and briefcases walking in the opposite direction of the city's core. It was a very unique scene. The aftershocks came constantly, every 5 minutes or so, until midnight. We've felt about 10 today. They were unnerving at first, but you become accustomed to them after awhile. Now the big scare is Japan's nuclear reactors. The reactors in concern are 260 km north of Tokyo. The media is portraying the worst possible scenarios, but from what we hear, we are in no harm. The winds are pushing to the sea and beyond a 10-20 km radius is supposed to be ensured to be safe. I won't lie, it's still unsettling. But panic won't help me. We are, however, preparing for a blackout tonight. We've been told to expect a 3 hour block with out electricity. We just cooked a bunch of food, filled the bathtub, and poured ourselves a drink to enjoy while watching movies. I think Star Wars is about to be queued up. We feel great sadness for the people to the north in Sendai and the surrounding regions. Our sense of uneasiness is nothing compared to the grief and aftermath they are grappling to make sense of today.